The likelihood of a toenail ‘digging in’ and becoming sore down the side is dictated predominantly by the shape of the toenail. If the transverse shape of the nail is like a letter ‘n’ (curls from one side to the other) then the nail is described as being involuted. Genetic predisposition determines whether the nail is likely to be involuted or not, although significant trauma to the nail unit can also occasionally cause the nail to be involuted. An involuted nail on the large toe has far more potential to become symptomatic than on the lesser four toes. A toenail that is involuted is infinitely more likely to dig in and become sore than a toenail that is relatively flat, particularly following trauma and/or over zealous pedicure. Although there is a significant minority of people with involuted nails who rarely (if ever) have symptoms, the fact is that with an involuted toenail you have the odds stacked against you with regard to the likelihood of experiencing periods of the nail ‘digging in’ and becoming sore. When involuted toenails do ‘dig in’ and become sore most people will attempt to trim them back in an effort to gain relief. For some this will become a never ending cycle of trimming back, gaining relief (for a while), and then trimming back again etc. 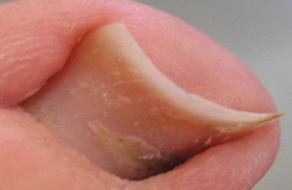 A Podiatrist would seek to relieve a painful involuted toenail by trimming back the offending side of the nail. Relief of symptoms would be immediate and the treatment would be quite painless. However, when we are presented with an involuted toenail that has required regular attention, then we would strongly advise that the patient considers having a Partial Nail Avulsion. A Partial Nail Avulsion is a minor surgical procedure undertaken with local anaesthesia that involves removing the offending side(s) of the nail and corresponding matrix (root) tissue. 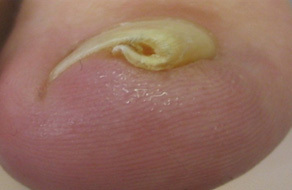 The area is then cauterized to prevent the side(s) of the nail from re-growing. This procedure will provide an instant, permanent, and painless cure for any painful involuted and ingrowing toenails. The cost of a Partial Nail Avulsion is £195 which includes all follow up dressing appointments and the provision of all dressing materials.